Introduction: Among the several professionals who use their voices as the main "working tool", with no doubt, the teachers form the group which are more frequently affected by vocal alterations, either due to the wrong use or the outrageous use of the phonatory function. Aim: To evaluate the work features and occurrences of hoarseness in grade school teachers of public and private schools in the city of Belém do Pará. Method: It was collected clinical, professional and personal information, through questionnaires, from 120 basic education teachers of the schools in Belém. Results: 53.84% of those teachers who had presented hoarseness used to give their lessons exclusively in classrooms provided with fan, and 46.16% in classrooms with conditional air. 48.86% of who only used atomic paintbrush had complained of hoarseness. Vocal care, working hours, time of profession and number of pupils were also discussed. Discussion: In the study sample, the results showed no statistically significant difference in the prevalence of hoarseness in the exposure to fan or air conditioning and between the groups which used chalk or paint brush. However, there was significant relationship between lack of care and voice hoarseness. No clear association was found between the uprising of the researched symptoms in the daily working hours, and there was no evidence of expressive influence of the weekly working hours. Conclusion: In the group of teachers who had been teaching less than fifteen years, there was a higher prevalence of hoarseness and, for this symptom, the number of students per class showed up as a potential risk factor. Among the several professionals who use their voices as the main "working tool", with no doubt, teachers form the group which are more frequently affected by vocal alterations, either due to the wrong use or to the outrageous use of the phonatory function. This is because there is a need of adaptation of the phonatory organs that are sensitive to the uprising of early dysphonic symptoms, by harming teachers' activity (1,2,3). In Brazil, statistical studies show that 25% of the economically active population depends on the voice to perform their occupation. It is estimated that 2% of Brazilian teachers (around 25,000 professionals) will withdraw their activities due to problems on the larynx and vocal folds (3,4,5). The IPAMB (Instituto de Previdência e Assistência do Município de Belém) recorded, in 2005, 182 cases of occupational disease in the city service. From those, 47% belongs to the Department of Municipal Education, and from these 30% suffers from dysphonia and acute hoarseness; 19% of them are teachers (6). This study aims to evaluate the work features and occurrences of hoarseness in grade school teachers of public and private schools in the city of Belém do Pará. The human voice consists of the physical reflection of thoughts. It is essential for human communication, when one can transmit their thoughts and ideas. It comprises one of the most important extensions of the personality and it is a fundamental tool in teachers' life, because it is through their voices they convince and influence their listeners. This tool requires a precise adaptation of the phonatory organs that are sensitive to the uprising of early dysphonic symptoms, by harming teachers' activity (2,7,8,9). There is no doubt on the importance of the voice in human communication. Nowadays it is visible the progressive increase of professional who depend on their voices as a working tool. Most of these activities derive from the technology changes, which allow a more enlarged communication, such as telemarketing (9). Nevertheless, there are other professional voice users, such as teachers, singers, singing teacher, broadcasters, TV entertainers, actors/actresses, receptionists and politicians (10). The voice used for professional purposes was defined as a "way of oral communication used by individuals who depend on it to perform their occupational activities". The occupational use of the voice means that patients depend on it to make their living (9). According to data researches from Núcleo de Saúde do Trabalhador (Center of Workers' Health) in Belo Horizonte, in 2002, there was an increase from 7,000 to 35,000 cases of dysphonia in the last 10 years (11). There is the reason why professional voice users, teachers for instance, are potential candidates to develop vocal alterations (12). Researchers suggest that teachers are more likely to suffer from vocal alterations and to be under a high risk of speech disorder, by being affected by what it is called occupational dysphonia (13). However, according to Consenso Sobre Voz Profissional (Agreement on Occupational Voice), in August 2004, in Rio de Janeiro, the so called 'occupational dysphonia' should be replaced by "occupational disease" or "work related", for representing only one of the several symptoms that might comprise a Work-related Laryngopathy (14). The dysphonia dysfunction, which was hardly considered for a long period, is now an important disorder, and its consequences affect directly the professional voice users, in both professional and social terms, especially teachers. It has been lately considered as an occupational problem, once it reduces the productivity and regularity of these professionals' job (15); it represents any difficulty on vocal emission that prevents natural voice production (5,12). These voice alterations are classified as: primary, which means the incorrect use of the voice; and secondary, which is the vocal unfitness to the environment or activity, or even of psychogenic order resulting from a process of emotion influence experienced by the individual on their voice (16). Symptoms might be from effort to emission; difficulty in maintaining the voice; lack of volume and projection; loss of vocal efficiency and little resistance when speaking (12). The main types of organic lesion resulting from functional dysphonia are: vocal cords nodules and polyps. The vocal cords nodules are bilateral projection almost always symmetric and are located at the transition of the middle and anterior thirds of the vocal folds. They are sessile and reddish most cases. The vocal cords polyps are exophytic lesions, often unilateral, that are more often located in the free board of the midpoint of the membranous of the vocal fold. These two alterations of the mucosa of the vocal fold are similar when they represent an inflammatory response of the mucosal tunic to aggressive agents, when these are either from external nature (chronic allergic reaction or chronic inhalation of gases, chalk powder or cigarette smoke) or from vocal behavior (chronic abusive use of the voice) (5). Several studies show that the main complaints from teachers as any alterations on voice are fatigue and hoarseness (17). Some professionals take the term 'hoarseness' as a synonym for dysphonia. However, different types of dysphonia are established by different acoustic patterns, different anatomical localizations and different origins. Hoarseness is only one of the symptoms of a greater involvement (16). In order to characterize the risk factor for vocal alteration, one should consider the aspects such as intensity, exposure period to these factors and time organization of the activity, as well as the working hours and break arrangements (9). Such risks could be classified as: a) organizational factors of the working process: long working hours; excessive number of students in the classroom; large amount of activities and functions; excessive vocal requirement; lack of breaks and resting areas during working time; lack of autonomy; stressful rhythm of work; working under pressure and dissatisfaction with work and/or remuneration. B) environment factor: b.1) physical risks: sound pressure level above 65dB; lack of a planning on suitable furniture and material resources; discomfort and thermal chock; improper ventilation and air conditioning use; b.2) chemical risks: exposure to chemical products that irritate the superior airways and exposure to old workplace that are dirty by chalk dust and/or smoke (9,17,18). Further, occupational stress, as a risk factor to vocal alterations, has been observed worldwide. The stressful factors caused by professions which require a high level of public contact is called burnout syndrome, which is a response to chronic emotional stress. Among several types of reactions to this syndrome, there are abusive and improver voice use by creating efforts and adaptations of the phonatory organs, what makes professionals more prone to developing vocal disorder (5). Several studies performed in different schools around the U.S.A showed that a lot of teachers, especially the ones with multiple symptoms, reported that the voice disorder affects negatively their professional abilities and their voices are a chronic source of stress and frustration (19). Besides the work-related risks, other might be present and should be under care. The main voice biological enemies are alterations caused by aging, allergies, superior airways infections, hormone influence, medication, alcoholism, tobacco and dehydration, and further, there is the need to investigate the presence of gastroesophageal reflux signs (9). The infectious factors, including sinusitis, reduce resonance and alter the respiratory activity, which causes changes on voice. The primary effect of the superior airways infections is to act directly over the pharynx and larynx, causing irritation and oedema on vocal folds. These infection processes may cause harmful signs such as throat-clearing and cough that might cause traumas on vocal folds (5). There are over three million active teachers in the U.S. In Brazil they account for two million. This group of professionals is considered the most likely to present occupational voice-related disorders when compared to the population in general (9,18). Several studies have reported that around 20% of teachers have missed work due to voice problems some time in their life (20). Different researches, performed in São Paulo and in other states, showed 97% of occupation re-adaptation by voice disorder are among education professionals (9). In 2001, at the 1st Reunião Pró-Consenso Nacional sobre Voz Profissional (National Congress on Occupational Voice), it was considered that the disorders related to the phonatory organs, caused by or harmful to work, has an important role in terms of social, economical, professional and personal impact, what account for an over R$200 million damage per year, in Brazil (14). The "occupational voice" issue has been increasing. A successful Brazilian action called "Voice Campaign" is one of the most important international events in Otorhinolaryngology field (3). As the occupational focus has increased due to dysphonia disorder, the ENT professional must update the clinical approach of the professional voice users (15). In order to evaluate these professionals and guarantee a proper scientific support, a multidisciplinary protocol was established. This consists of an anamnesis, physical exam, laryngeal endoscopy, perceptive analysis of voice and application of the Voice Handicap Index (VHI). The latter consists of a questionnaire of vocal ability self-evaluation, with the purpose of measuring the difficulties experienced by individuals with vocal disorders (15). After diagnosing the disease, therapy should offer the best conditions to patient, by using vocal orientation resources and rehabilitation, medication and surgical procedures if needed. Preventing is essential due to the continuous voice use. Teachers need to preserve their voice by making mouth hygiene, attending vocal therapy sessions and doing vocal exercises (21). Diagnosing the disease is fundamental in order to measure and qualify its distribution, by helping an efficient planning of preventive actions and assistance. Therefore, if there is a suspicious of work-related voice disorder, professionals should report to Comunicação de Acidente do Trabalho CAT (Accident at work compensation claim) (9). Although new pedagogical resources have been arising, such as educative videos, the most important working tool for a teacher is still his/her voice (14). For being considered a 'working tool' besides a reflex of physical and mental health, the voice deserves special attention and care (22). Teachers are solid models and opinion makers for their pupils, so voice caring and negative aspects that it may bring to the professionals and pupils have been the purpose of several studies on this field. All teachers who took part in this study were interviewed according to received notions of the Declaration of Helsinki and Nuremberg Code, in accordance with ethics principles for human experimentation set (Res. CNS 196/96) Conselho Nacional de Saúde (Health National Board) after the approval by the Ethics Committee on Research of UEAP and authorization of principals whose schools, in Belém do Pará, were involved in the research. Teacher also signed a Free and Clear Consent Term to take part in this research. In order to perform this study, it was gathered clinical, personal and professional information through a questionnaire based on the one used for the teacher self-evaluation by the Tripartite Commission to Occupational Voice of the Ministry of Labor, Subdelegacia do Trabalho SDT 1 Norte/SP (Labor Sub office). 120 basic education teachers from private and public schools were interviewed. This study is characterized as prospective, individual, observational and transversal defined as an epidemiological investigation. It is statistically non-conclusive. There were no specific criteria for the selection of teachers for this research. There was an approval from the institutions where they worked and from the teachers themselves. It was selected 120 basic education teachers from private and public schools who had been working at least for a year. They had to sign the Free and Clear Consent by agreeing on the research method. Teachers who were under phonotherapy did not take part in this study. The data collected from questionnaires comprised of: life-long occupational symptoms that were present in the moment of the interview (hoarseness); teaching time; number of students per classroom; maximum daily working hours; average weekly working hours; classroom temperature (by having fan or air-conditioning); writing material available (chalk or paint brush) and vocal cares along their occupational life. All teachers' identities were not revealed and all data were stored in a database. All the analyses were performed on Epi Info 6.04d, and the Qui-squared test was applied to categoric variables. The significance was evaluated according to Relative Risk (RR), by considering a trust gap of 95% and p<0.05. Regarding the presence or absence of hoarseness, the results were similar for teachers who were exposed to either a fan or air-conditioning in the classrooms. Fifteen teachers who worked in places where there were both fan and air-conditioning were not excluded from this evaluation. Most teachers did not made use of chalk, as observed in the table below. It was evidenced that taking specific vocal care was not a condition for protection. Teachers were divided into two groups, by considering 8 working-hours a day as a divisor. Some of the teachers reported 16-working-hours/day on their main work day. It was used a homogeneous sample regarding the effective occupational time. The number of students in the classroom was evident as observed in the table below. The importance of the voice and communication is an unquestionable issue for humans. Nowadays, it is clear the increasing number of professionals who depend on their voices as a working tool. Nevertheless, it is important to emphasize that vocal alterations, which are caused by excessive use of voice and most times in an improper way, have made teachers, telemarketers and broadcasters to be off work and to be unable to perform their activities, by implying financial and social costs (9). At the present moment, teachers are the most affected group with vocal alterations (1). Researches from Brazil and worldwide reveal that the main complaints by teachers are: hoarseness, vocal fatigue, pain or irritation and throat-clearing. Among Brazilians and Americans, hoarseness is the most common symptom (17,22). This study presents 120 cases of basic education teachers from private and public schools. Sixty (50%) of them reported hoarseness in some time of their lives. From the 105 evaluated teachers, regarding the relation between hoarseness and the use of fan or air-conditioning (Chart 1), 52 of them presented hoarseness; 28 (53.84%) used to work in classrooms equipped with fan and 24 (46.16%) in classrooms with air-conditioning. In that way, there was no significant influence from both gadgets as risk factor. 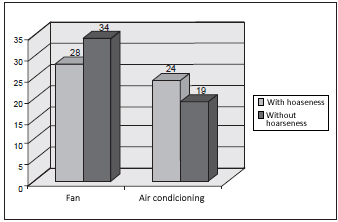 Chart 1 - Relation between teachers' hoarseness and the use of fan or air-conditioning in the classroom. - Source: Study questionnaire. Nevertheless, according to literature, the air-conditioning is the main risky factor to develop vocal alterations, as it affects the mucosa of the vocal folds by making their vibration difficult, what causes secretion formation and nasal and laryngeal irritations, besides it causes a drying on the oropharynx (13,21). From the 120 teachers who were interviewed, 22 were not selected for the analysis of the relation between hoarseness and the use of chalk or paint brush (Chart 2), due to the use of both. Then, 88 teachers who used only paint brush were examined; and 43 of them (48.86%) complained of hoarseness. Regarding the ones who used only chalk, five teachers (50%) reported such symptom. 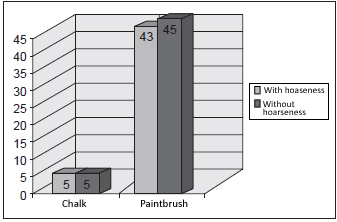 Chart 2 - Relation between teachers' hoarseness and the use of chalk and paintbrush use in the classroom. - Source: Study questionnaire. There was no significant difference between groups regarding this result. This information does not agree on most researches which report that teachers who use chalk are more likely to vocal alterations, thus, the habit of speaking towards the board, what it makes easier to inhale chalk dust, irritates the larynx by causing a drying and hoarseness in the throat. Further, the accumulation of chalk dust in the classroom increases the possibility of developing respiratory disorders such as allergic rhinopathy. Therefore, the paint brush works as a protective tool; it prevents teachers to expose themselves to chalk dust (13). Due to all these conclusions, Oliveira (1998) suggests the exchange of chalk to paint brush. Regarding hoarseness and the vocal care (Chart 3), half of the sample presented hoarseness. 45 (75%) from those did not report any vocal care, while 15 (25%) had done some procedures for vocal caring, such as avoiding drinks at extreme temperature and speaking loudly. Chart 3 - Relation between teachers' hoarseness and the presence or absence of vocal cares. - Source: Study questionnaire. This finding agrees with Alves and Cavalcanti (1998) who report a large amount of teacher who do not know about vocal caring procedure or simply do not do it. They, as well as Menezes (1996), also reported that most teachers are not familiar with the phonatory system or proper care with voice use; and such lack of care makes them to be more exposed to vocal alterations. Hence, Costa (1988) pointed that teachers should be aware of the importance of vocal hygiene. Dambrósio (2001) stated that teachers, since their career start, should be alert on vocal care as a preventive procedure to prevent vocal alterations. These cares implies not shouting during lessons; not smoking; not drinking alcohol; drinking lots of water; eating lightly before lessons; avoiding thermal chocks and not long exposure to air-conditioning (3,21). 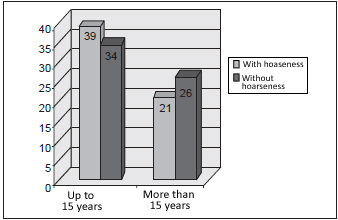 The hoarseness and working-hour relation (Chart 4) showed 60 teachers with hoarseness. 31 of them (51.7%) used to work over 8 hours a day and 29 (48.3%) up to 8 hours a day. Based on this information, daily working hours there was no significant association to vocal decay, regarding this sample. Such data agree with Urrutikoetxea (1995), who did not find a clear relation between working hours and presence of laryngeal alteration on teachers. 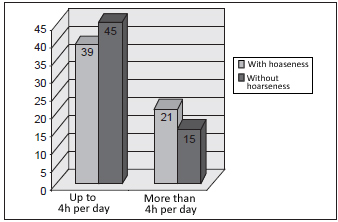 Chart 4 - Relation between teachers' hoarseness and daily working hours. - Source: Study questionnaire. Nevertheless, there is a difference when comparing Souza and Ferreira's (2000), who pointed working hours as a risky factor to the voice, as there was a significant statistical association. Regarding hoarseness and weekly working-hour relation (Chart 5), 60 teachers reported such symptom. 39 from those (65%) used to work up to 40 hours a week and 21 (35%) over than 40 hours a week. 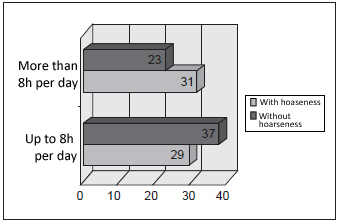 Chart 5 - Relation between teachers' hoarseness and weekly working hours. - Source: Study questionnaire. This disagrees with Penteado (1996) who found a significant statistical association between vocal alteration and over 40 hours of working time. It also disagrees with Fuess and Lorenz (2003) who observed a direct relation between dysphonia frequency and weekly working hours. Souza and Ferreira (2000) observed that teachers who work more than 25 hours a week are more likely to vocal alterations than the ones who work 25 hours or less in a week. However, there is a difference on the parameters of working hours between such research and the current study. The significant relation between voice disorders and working hours might be due to the fact that the abusive and bad use of the voice may cause an inflammatory response of the mucosal tunic of the vocal folds, thus, allowing the rising of organic lesions such as nodules, polyps and oedemas. Therefore, the result from this evaluation agrees with Ortiz (2004) and Sapir (1993). They reported that the dysphonia occurrence is not directly influenced by week working hours. It is noticeable that the relation between vocal alterations and working hours is questionable among researches. Then, the relation between hoarseness and working hours in classrooms should wait for future studies. Regarding the relation between hoarseness and occupational work time (Chart 6), 60 out of 120 teachers reported such symptom. From those, 39 teachers (65%) had been working less than 15 years, while 21 (35%) over 15. Chart 6 - Relation between teachers' hoarseness and occupational work time. - Source: Study questionnaire. This difference agrees with Penteado (1996), who found that the most dysphonic teachers had been performing their profession from 6 to 15 years (52.4%). It also agrees with Dragone (1999), who affirmed that teachers' voice suffers an expressive damage after two years of teachership. All these results can be justified by the fact that the younger the teachers the less experience and knowledge of prevention to vocal disorder they have, besides for having little experience they own less ability to face the several adversity that might arise in a classroom, such as sound level competition. However, these findings are not in accordance with Anjos (1999), who observed that the occurrences of these symptoms increases in proportion to teaching years, probably due to a higher exposure to vocal fatigue. Regarding the relation between hoarseness and number of students in the classroom (Chart 7), 60 teachers presented hoarseness. From those, 46 (76.7%) had been teaching more than 30 students and 14 (23.3%) teaching less than 30 students. 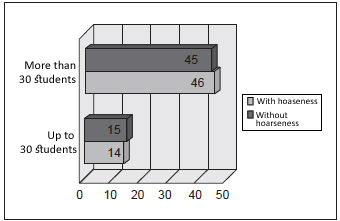 Chart 7 - Relation between teachers' hoarseness and the number of students in the classroom. - Source: Study questionnaire. This survey is in accordance with most published works, such as Fuess and Lorenz's (2003), who observed a direct relation between vocal disorders occurrences and number of students in the classroom. Though, there are studies, by Ortiz (2004) for instance, that does not report any significant difference between vocal alteration occurrences and the number of students in the classroom. 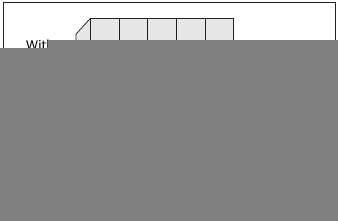 Based on the information mentioned in this study, it is understood that a suitable number of students inside a classroom should comprise from 20 to 30 at most, once the smaller number of students per room the lower the noise becomes, thus there is less sound competition between teacher and student. In addition, the tension and intensity of the teacher's task is reduced. The results from the studied sample did not reveal a significant statistical difference on hoarseness prevalence in relation to the use of a fan or air-conditioning, and between the group which made use of chalk or paintbrush. Nevertheless, there was significant relation between hoarseness and lack of care. There was no clear association of the uprising of the researched symptom with daily working hours, as well as weekly working hours. The group of teachers who had been working for less than fifteen years presented prevalence of hoarseness presence; and for such symptom, the number of students per room was considered a potential risky factor. 5. Medical Student (sophomore of Medicine course at Universidade do Estado do Pará. This article was submitted to SGP (Sistema de Gestão de Publicações) of R@IO on April 15th, 2008 and approved on June 12th, 2008 at 12:17:11.